Taylor has a lot of athletic ability but I don't think he will have a lot of success as a NFL starter. Positives: Taylor is tall enough to play quarterback in the NFL even if he doesn’t have good size for the position. He has very impressive mobility and he is incredibly elusive for a quarterback. He buys time very well with his legs whether it is inside or outside of the pocket and he has extended a lot of drives with his ability to scramble and pick up yardage. He really is a fluid athlete, especially for the QB position. He has a very strong arm, he can flick his wrist and ball just flies off of his hand. He has shown considerable improvement in each of his seasons as a starter at Virginia Tech and his accuracy has really developed a lot over his four years as a Hokie. He throws a great deep ball even if it has some air under it at times, but he places the passes very well in game situations. His accuracy has come a long way on other throws as well, plus he has shown more willingness to scan the field, step up in the pocket to buy more time to find a throwing lane, and his decision making has really matured thanks to his vast amount of starting experience. His pocket poise has developed a lot and overall he is a much more fundamentally sound player now that he has been starting for so long. I do think he has become a leader on the Hokies but I don’t know if he is a team leader that can rally the whole team to victory. 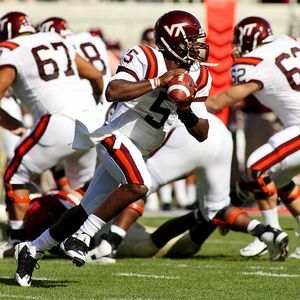 Negatives: While Taylor’s accuracy and pocket poise have really developed over his time at Virginia Tech they are still not on the level of a quality NFL starter in my opinion. Taylor’s size also hinders him as a QB because he will struggle to see over his offensive line in the NFL if he ever becomes a starter, and he doesn’t have a great feel for the pocket to move within it to find throwing lanes. His accuracy was much better this season but he will still miss throws that he should make pretty routinely. His accuracy is just not very consistent on short/intermediate levels. His anticipation isn’t very good either and I have rarely seen him “throw a receiver open” and he doesn’t go through his progressions very well. Instead he will regularly drop his eyes and look at the rush to try to escape the pocket and improvise. That really hurts him because in the NFL he won’t be able to scramble after looking at his first or maybe second read and have a lot of success. Defenses are too fast and he will be bottled up very quickly if he tries to do that. His pocket poise isn’t very good either because while he has definitely learned to stay in the pocket more and wait for routes to develop, etc. his first instinct is still to run when he is in trouble, not to step up to find a throwing lane and deliver the ball downfield. His instincts tell him to scramble, hold onto the ball longer than he should and to try to either get outside the pocket to improvise or to run and pick up yardage with his feet. Overall: Taylor has really come a long way and has given people a lot of pause when watching tape because at first glance you think “wow, he isn’t a running quarterback anymore, he’s a passer first.” While that may be true, he still has some tendencies of a running quarterback and they hinder him as a prototypical drop-back passing prospect. He doesn’t have great anticipation on his throws, his accuracy is inconsistent and his pocket poise leaves something to be desired because he regularly leaves the pocket prematurely when he senses pressure. However, I definitely think Taylor has talent that is worth developing at QB in the NFL and I think he will at least get a shot to stick as a #3 developmental guy on a NFL roster. He has great arm strength, his accuracy has improved steadily every year at Virginia Tech and his athletic ability makes him an intriguing talent at the position. I think he can eventually be a solid back-up and potentially he could end up being a starter for a couple seasons. I don’t think he will ever be a pro-bowler, but I think he could be a solid game-manager that could extend drives with his legs and maybe make a playoff run if he has a good enough supporting cast and defense. Projection: 5th or 6th round. This is a very weak quarterback class so Taylor might go a little higher than this, but his ceiling isn’t very high as a NFL QB and he will probably be a career back-up. I think his career could mimic that of Troy Smith from Ohio State. He will flash some ability as a starter but overall he will be viewed as a back-up in the NFL. That limits his draft stock obviously, so I think he will be a later pick.